Thomas Halloran barely endured the loss of his wife and child. But the nuclear submarine captain’s world explodes with rage when he and his crew somehow plunge headlong into Earth’s distant future. Far beyond the 21st Century, Halloran must navigate his seething ire and a frenzied alien ambush. Forced to hide aboard an enemy transport, Halloran and his refugees hurtle through space toward an uncertain destiny. In a world with shifting alliances and technology they don’t comprehend, the captain and his crew must quickly learn to adapt their strategies from the past or risk extinction. Fighting his own fury, will Halloran’s obsession with revenge turn this alien battle into their last? War Without Honor is the gripping first book in the Halloran’s War military sci-fi series. If you like tormented captains, impossible odds, and a time-travel twist, you’ll love J.R. Geoghan’s futuristic tale. 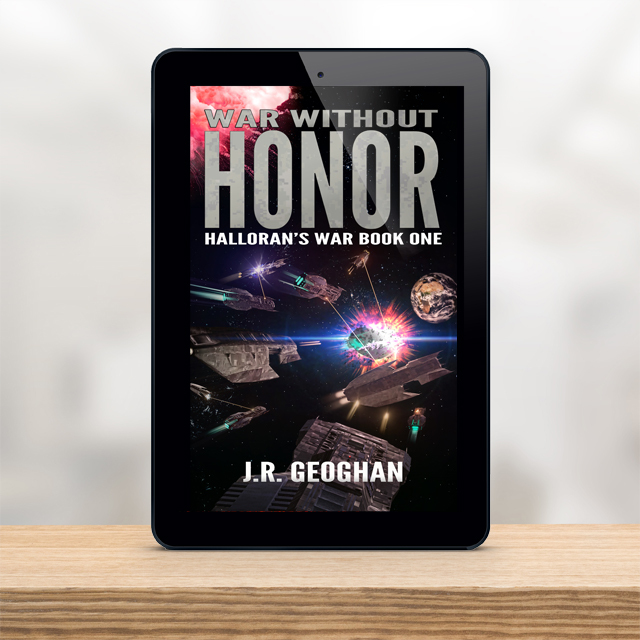 Reserve War Without Honor – Book One of the Halloran’s War Series – to battle amongst the stars!